Talk about your group of bright, shining faces, these eager and bright children are part of the morning session at Safety City. Their graduation is set for Friday. Karen Vollmer is in the midst of completing the second half of the 37th Safety City in Wauseon. All pre-kindergarten children are welcome, regardless of school district, to learn the beginnings of personal safety practices. Through demonstrations, skits, songs and Safety Friends who visit the classroom at Wauseon Primary School the children graduate with a greater sense of the outside world. Safety City makes a good transition for the children to embark on their primary schooling. Vollmer has been associated with Safety City for 24 years. First she was a substitute teacher who went on to being a full time instructor and eventually assuming the duties as director. This summer, the first session, which ran from June 1 through June 12, had 16 children in the a.m. and 15 children in the p.m. Each session is two hours long. 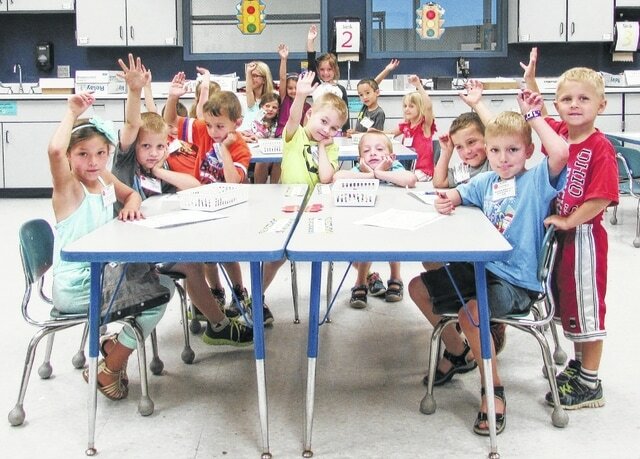 The second session, which started June 15 and will conclude Friday, June 27, has 18 children in the morning (9:30 to 11:30 a.m.) and 14 children in the afternoon (1 to 3 p.m.) for a total of 63 attendees. “We have had classes where the total children were in the low 80s, so this year’s participants are about average, quanity wise,” said Vollmer. The Safety Friends that the children meet include: “Tommy Transport” ( a remote-controlled bus operated by Dennis Peabody, a Wauseon school bus driver); Pam Waugh, Wauseon Transportation Director; school bus drivers Butch Kline and Carrie Dobaczewski; Wauseon Police Department friends such as Assistant Police Chief Bill McConnell; School Resource Officer Matt McDonough; CSX Railroad engineer Rich Hall; school crossing guard Lowell Schultz; Wauseon Firefighters: Assistant Chief Phil Kessler, David Bowen, David DuBry, Astin Quillett, Marcus Schuette, Jeremy Shirkey and Matt Wilson; Gun Safety with Fulton County Sheriff Roy Miller, Safety Pup (Jay Dettmer) and McGruff, the Crime Dog (Connor Hicks). Safety Friends on hand at graduation were Wauseon Police Chief Keith Torbet, Assistant Police Chief Bill McConnell, Fire Chief Rick Sluder and Patrolman Jose Gonzales. The student helpers, which Vollmer is so grateful for their energy and assistance are Kelcy Blanchong, Megan Carroll, Grace Leininger, Ava Manz, Amber Rufenacht, Sierra Rupp and McKenna Thierry. Should you or your organization would like to make a donation to Safety City, call Vollmer at 419-337-7227.